The full Moon which rose on Oct 14th 2008 was known as the 'Hunter Moon'. My goal was to catch a good quality Moon halo. Since the sky was crystal clear with some patchy fog the chances looked remote. However, the following morning a weak front was expected to cross over the country from the west and I speculated that high level cloud ahead of this system could present the conditions needed for a halo. As the night went on scattered cirrus drifted in creating a regular fragmented halo. I sensed that things would improve with time. I went out at 04.00 BST for a morning session and found what I was looking for. The Moon was high in the SW and the sky was covered in a widespread layer of think cirrostratus. Surrounding the Moon was an intense 22 degree halo. It was a complete 360 degree ghostly ring sporting white and red colours. It even had an upper tangent arc as an enhancement to the halo top, with faint extensions in a horizontal direction beyond the diameter of the halo. It was a beautiful sight on this dead silent night. There wasn't even a breeze so it felt surreal standing outside looking at the phenomena at this time of the morning. 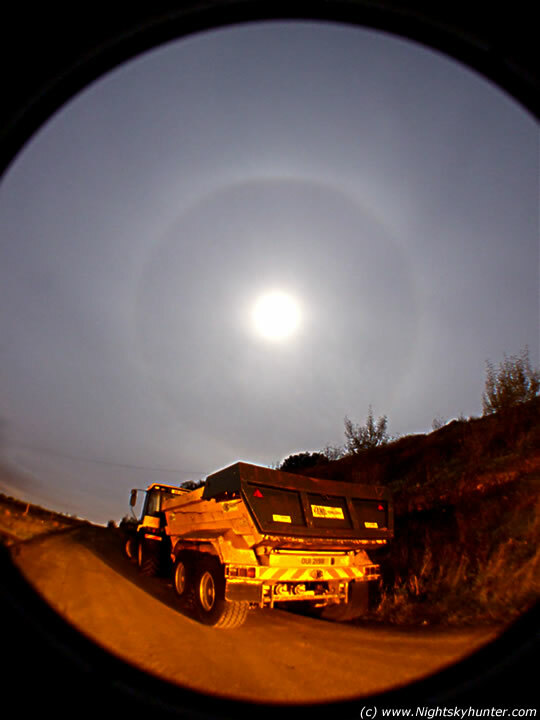 I took this image in vertical fashion with the halo above a neighbour's truck. The warm glow of the street lights contrasted nicely with the cold colour of the halo. I used a 58mm super wide angle conversion lens attached to my standard 28mm lens to get these images. Curvature of the field is very strong. Captured from near home at Maghera, N. Ireland.